From AACN experts comes a resource dedicated to helping you oversee or care for critical care patients in any practice setting. 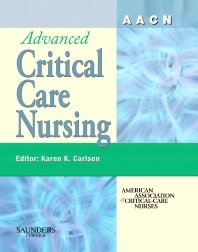 This comprehensive critical care nursing textbook addresses serious and potentially life-threatening patient conditions with a foundation rooted in the critical thinking process: the comprehension, analysis, synthesis, and application of knowledge. Endorsed by the American Association of Critical-Care Nurses (AACN), the largest specialty nursing organization in the United States, for the most authoritative coverage available. Thorough discussions of each body system emphasize advanced concepts, presenting physiology in an application format that examines the clinical implications of physiological science. Coverage of assessment focuses on interpreting abnormal findings and linking those findings to diagnosis and intervention. Appropriate interventions are discussed from an interdisciplinary, evidence-based perspective. Hundreds of new, full-color illustrations and design clarify important concepts and improve the book's usability. Complex, unfolding case studies are presented in all disease chapters, accompanied by review questions with a comprehensive answer key. Multidisciplinary Plans of Care provide at-a-glance information for common ICU conditions. Nutrition boxes appear in each relevant chapter, offering guidelines for patient needs with specific illnesses. Research-Based Practice Guidelines boxes and Promoting Evidence-Based Practice features appear throughout the text whenever applicable to present the latest research-supported nursing assessment and intervention practices. Drug boxes include common classifications of critical care drugs for specific disorders, including drug, actions, dosage, and special considerations. Applying the Technology features help you apply the latest technology to patient care. NIC Interventions boxes list NIC intervention labels appropriate for the conditions discussed in a chapter.